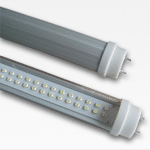 If you are using t8 fluorescent tubes as grow lights for sowing seeds or growing, you can easily switch to LED and continue to grow with the same fixtures/setup. These t8 tubes are to be used in conventional fluorescent tube fixtures that are of standard lengths 60, 90, 120 and 150 cm. Do not change your setup, just replace your grow lights. with our optimized diodes. Unlike other LED plant lighting, we have selected the wavelengths that affect the plant's different pigments the most. Typically other manufacturers use a much higher percentage of red wavelengths than we do, to make up for the unoptimized wavelengths. This makes the light are both wrong for plants and unpleasant to look at. With our plant lighting you get an even distribution of blue red and green light. It promotes the development of all pigment at the same time as the combination of wavelengths are the basis of white light. This does not hurt your eyes like conventional LED grow lights and it makes it easy to distinguish plant colors. promotes the production of anthocyanin which is plant flavors and coloring. Please click information in the menu to read more about this. If you grow to consume it is a great advantage to have a green light, as Anthocyanin in many ways is related to health.